Those who run a local business, or provide SEO services for small business owners, now have a competitive edge over national brands, because the latter don’t have physical locations in cities where most of their customers reside. Local businesses can have the icing on the cake by grabbing the coveted real estate on the first page of local SERPs. According to the Google research study “Understanding Consumers’ Local Search Behavior”, 4 of 5 consumers use search engines to find local information. Moreover, local-based searches lead to more conversions than non-local searches. But there is a flipside for the local market players, which is that there are constant changes and updates of the Google local search patterns. Let’s face the problem: in the last few years Google has made it even harder for local businesses to get noticed in local SERPs. 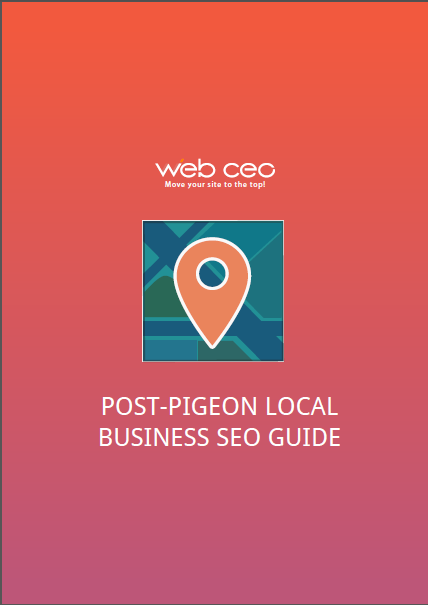 In 2014, Google released the Google Pigeon Update that totally redefined the way we do local search. The local 7-pack block of Google Places results were shrunken to a 3-pack or “Snack Pack.” The redesigned local pack boxes lack call buttons and exact address information (we can only see directions and website link buttons now). The search giant explained it simply; it’s all for the sake of a better user experience and the unification of desktop and mobile search navigation. Maybe some positive-minded folks welcomed this brave new world, especially if they were in the top 3 of Places and saw an increase of the click-through rate to their websites. But most of the small business owners who were listed 4th or lower suffered from a drastic traffic drop and a dearth in phone calls. 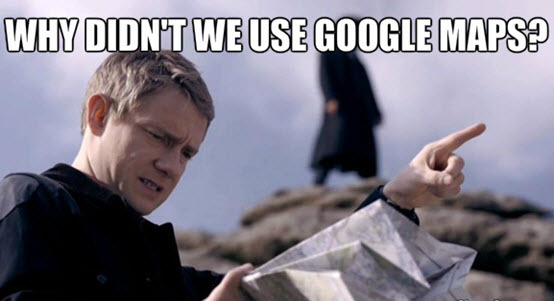 Then another unexpected update from Google followed: the shocking removal of its location filter in search settings. 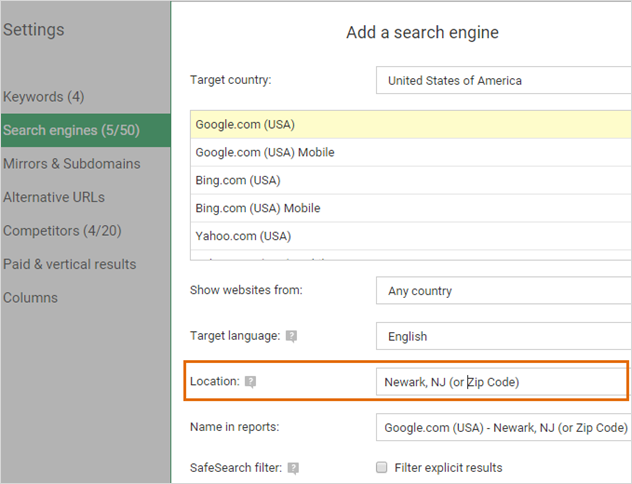 This caused a lot of discontent from many webmasters and business owners who used this feature to see how local results would look from the locations their clients reside in. Explicit location modifier is provided on the part of a searcher who adds an explicit geographical term (names of country, city, street, district, etc.) to the body of a search query. 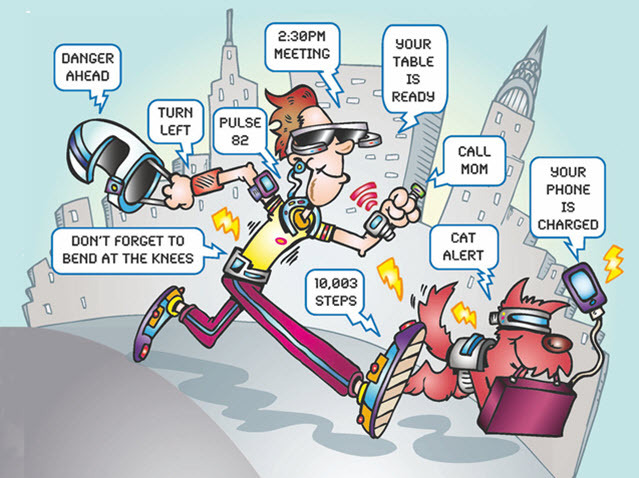 User location modifier is an automatic identification of the user location by device location service data like an IP address, GPS, Wi-Fi hotspots, in order to deliver the most relevant local information without the user having to manually add a location modifier to her search query. Browsing history stores some useful information about the user that helps identify the most relevant search results for a specific user. With the above mentioned pitfalls of how Google serves local search activity, there is still some wiggle room for getting approximate ranking positions for your or your client’s location-based website. Note that the following methods of getting local rankings for target keywords don’t give a rock-solid guarantee of explicit and accurate results. 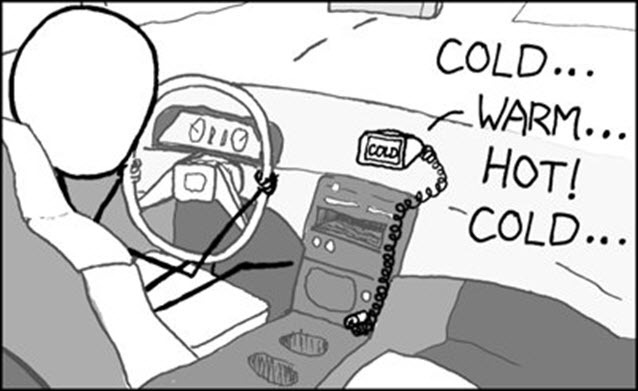 Each of these methods have obvious drawbacks. They are time-consuming, require manual multistep actions and results are difficult to report to clients. 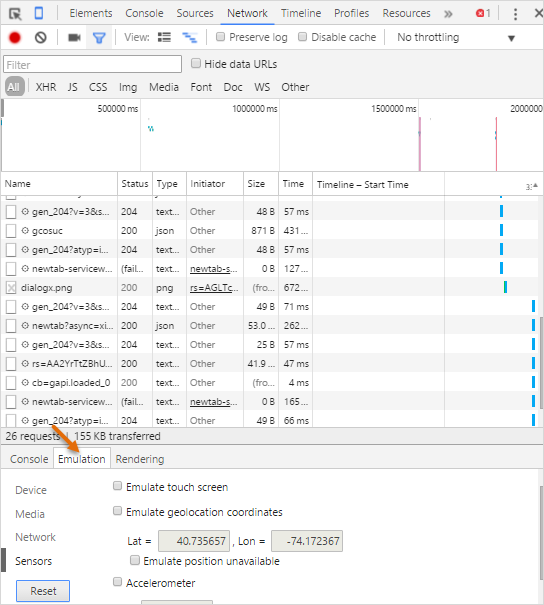 Incognito mode or a logged out option can be activated by clicking on a “New incognito window” that is placed inside the settings bar at the top-right corner of your Google Chrome browser. This is a simple way to emulate an average search. On the one hand, an incognito window allows you to surf the web without caching your browser history and deleting all cookies after you close the window. But this doesn’t actually hide your IP address and location. This means that the results for your local business related terms might differ from those that your prospects see in their localized search. However, the Incognito mode can be a good solution for those who check ranking positions from the nearby location to their prospects. But keep in my mind that if you enter a search query and get results for it, once you refresh the page or do a new search with the same search query, the results may differ from the previous check. 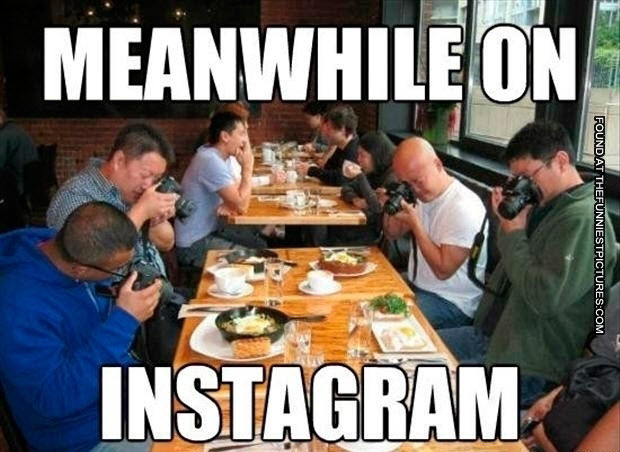 Be sure to clear your cache or open a new incognito window. Google’s AdPreview and Diagnosis tool provides a more accurate emulation of a search from the location of your targeted audience. It also allows you to emulate language, device type and set a Google domain for a specific region. 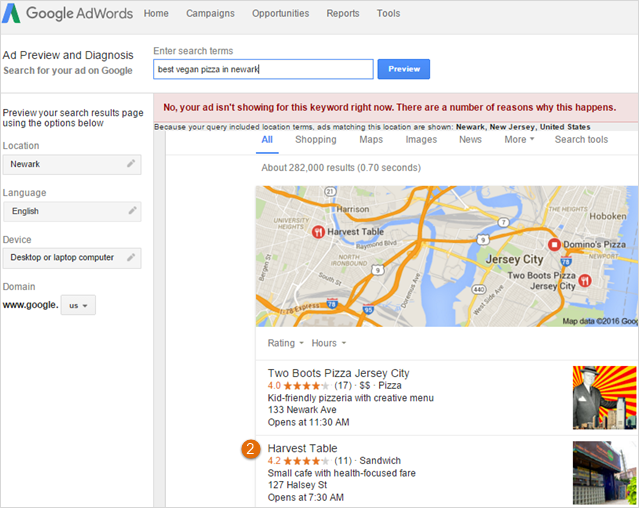 Even if you are logged out or don’t have a Google AdWords account, you can still use the tool. The website we decided to monitor is http://www.harvesttablenewark.com/. Here it is shown in the 2d position in the local pack results. That means that you shouldn’t rely on the results provided by this free tool which is supported on a rare basis. 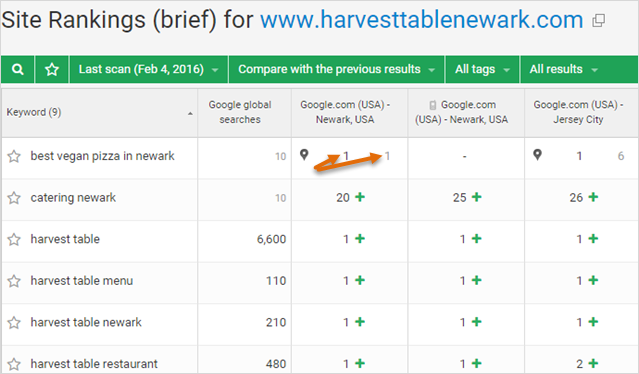 According to this tool, the Harvest Table site is ranking in the 2d position within local pack results. You can then click on Sensors and put the specific locality coordinates into the boxes of Latitude and Longitude. The longitude and latitude for a specific location you can find here. Open a new window and start your local search. According to this method, my website is 2d in the “3-pack”. 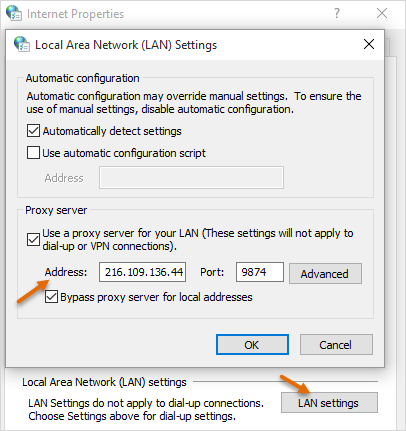 Click on Change proxy settings and configure your Internet Properties by adding a location-specific proxy in order to transmit your emulated local address to the web. Using this method of location emulation, I found my website in the 1st position of local pack results. I want easy-to-read reports with more accurate local rank tracking now! And that’s what we are here for! With the Web CEO Local Rank Tracker you can just forget these unhandy ways of local rank tracking that take a great deal of your time. Go to the Rank Tracking tool and click on the Keywords tab in the settings of the tool. 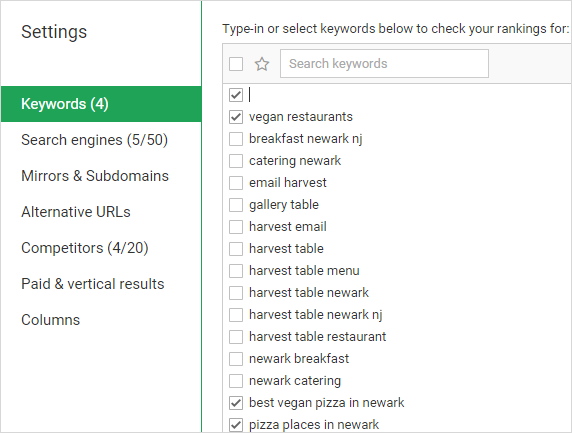 Add your targeted keywords and local terms. Click on the Search engines tab in order to add all the search engines you want to track your site positions on. We provide our customers with the ability to add country specific search engines (you can add up to 50! ), including mobile ones and you should also add a specific location (e.g. 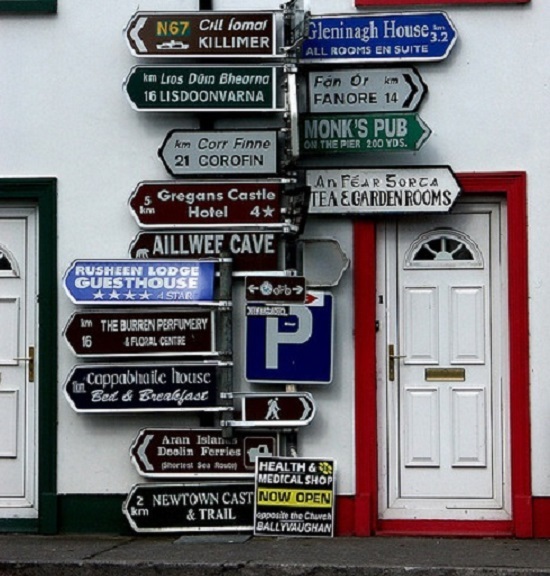 state, city, ZIP code) in order to emulate search results as if you were tracking right from your customers’ locations. Scan your ranking report in order to see if your site has any positions among organic and vertical (3-pack, ads results etc.) local results. On the screenshot below you can see two digits (1:1) which means that our website has the 1st position within the local pack Google Places results. We consider the local pack box on Google as the 1st position and we see your site’s Google Places listing as a subordinate number to that first position held by the local pack When you click on a keyword in your ranking reports, you can see cached results for the keyword from the actual SERPs. 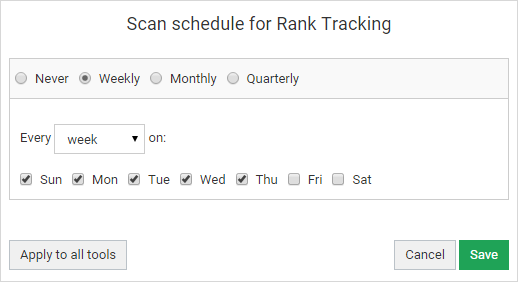 We also let you set a scan schedule on a regular (weekely, daily for an Agency Unlimited plan) basis for you to keep a close eye on fluctuations, hopefully improvements, in the rankings you track in your local campaigns. What other features of Web CEO can serve you in your local SEO? 1. You can track your site listing positions for branded local terms on third-party local business listing directories like Yelp, TripAdvisor, Zomato etc. To do this, go to the Rank Tracking settings and click on the Alternative URLs and paste your business listing page URLs (if you have them) from business related directories. And start tracking your Yelp and local directory business listings performance. You must have noticed that the first 2 or 3 results pages are often saturated with local business listing sites like Yelp, TripAdvisor, HappyCow, Zomato, etc, which can list your website among others or even present a special page for your business that gets a direct listing on Google, but your own URL won’t be shown in Google. If you really want to be easily found on the first page of Google local search results for localized terms and non-branded keywords, you should definitely evaluate your local business SEO strategy. 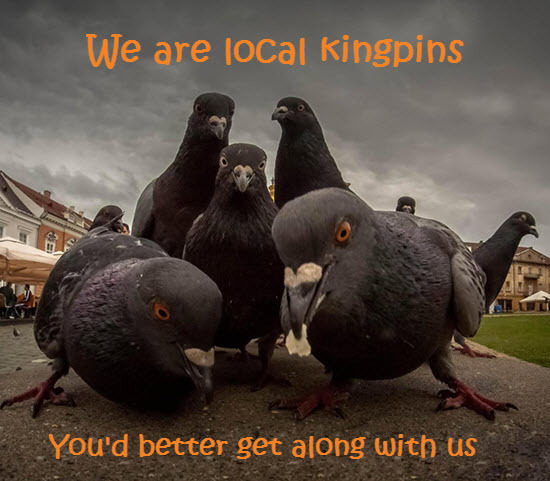 What Are the Effects of the Pigeon Local Search Algorithm Update for Your Local Business?